Home | Llanilar Tourist Information and pictures of Llanilar, Ceredigion, Wales. Llanilar is a village in Ceredigion, West Wales. It stands on the A485, in the beautiful Ystwyth Valley, between the towns of Aberystwyth, to the north west, and Tregaron to the south east. The village contains a parish church (St Hilary's), a Welsh Presbyterian chapel, a Pub (the Falcon Inn), a primary school, GP Surgery and garage. The historically important St Hilary's Church, parts of which date back to the 13th Century, is set in the middle of the village of Llanilar. St Hilary's has a squat and crenellated square tower, a chancel, nave and porch, and an interesting oak roof built in 1431. In the porch is a hollowed stone for holding holy water, and above the door an ancient beam with carved heads and animals. Llanilar railway station on the line from Carmarthen to Aberystwyth opened in 1867 and closed in 1964 following severe flooding in the Llanilar area. Also in the centre of the village is the Falcon Inn - a good village pub which also acts as the local shop. It has a pleasant beer garden and serves food to both visitors and the local community. Walkers and cyclists are well catered for in Llanilar as the landscape is criss-crossed with trails and rights of way. Indeed the 21 mile (34km) Ystwyth Trail connecting Aberystwyth, on the shore of Cardigan Bay, with Tregaron in the northern Teifi Valley, passes through the village. Much of the Ystwyth Trail runs along the disused railway track and these comparatively level sections lend themselves to family cycling - involving younger children, wheelchair users, and the entire route is suitable for walkers. Substantial sections are also suitable for horse riding. The remains of a Roman Fort can be found at Trawsgoed to be found a short way along the trail to the east of the village. The annual Llanilar Show is a great attraction in the summer months with classes for Cattle, Sheep, Horses, Ponies, Show-jumping, Sheep Shearing, Companion Dog Show, Farm & Garden Produce, Cookery, Preserves, Wines, Honey, Handicrafts and Children's competitions. And of course anglers are well catered for with access to the banks of the Ystwyth River just yards from the village centre. Llanilar Angling Association offers both expert and novice game fishermen exciting sport on one of the premier Sea Trout rivers in Wales. The Ystwth offers the opportunity to go night fishing for double-figure sea trout, or sewin as it is known in Wales, and the chance to catch a salmon straight from the Irish Sea. Twelve miles of mostly double bank fishing, from Pontrhydygroes to the sea at Aberystwyth. Public fishing is available: day, week and season permits are available. 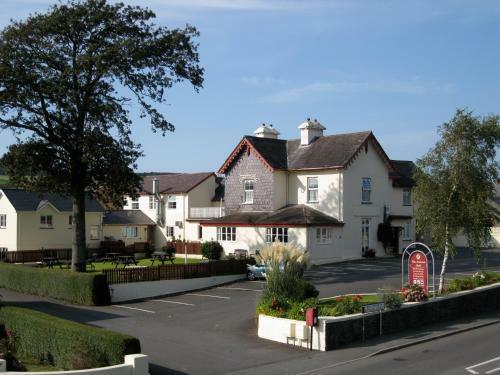 You may make an instant secure hotel or cottage reservation close to Llanilar. Hotel and cottage availability and letting rates are confirmed online prior to booking. Simply click through to the accommodation page, choose a suitable property, check availability, including dates of stay, to confirm the exact room rate and reserve the accommodation.